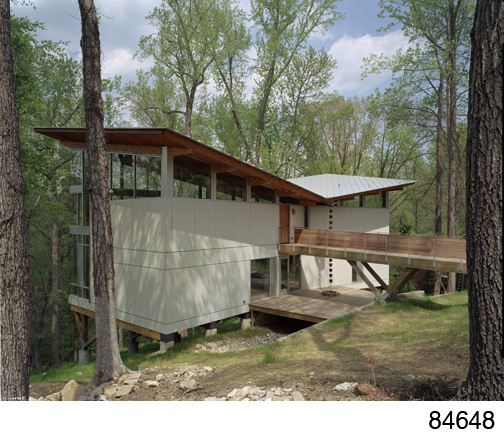 January 26, 2007 (RALEIGH, NC) – A modern house perched on a steep hillside in Raleigh’s established Laurel Hills neighborhood is featured this month in Architectural Record, one of the profession’s most respected journal. Raleigh architect Frank Harmon, FAIA, designed the 1800-square-foot house for Lynda Strickland when she relocated here from Washington, D.C. Her property is located within a 150-year-old beech and oak forest above Crabtree Creek. In the article, entitled “Frank Harmon raised the Strickland-Ferris Residence off the ground, then let its roof take flight,” Pearson addresses the innovative “butterfly roof….floating above a band of windows wrapping around the top of the building,” which also helps collect rainwater for irrigating the forest floor. Completed in 2004, the Strickland-Ferris residence has received design awards from the North Carolina Chapter of the American Institute of Architect (AIA/NC), and the AIA/NC Triangle section. It was also featured in Dwell magazine’s December edition.